It's Christmas Day in less than 24 hours in my part of the world and although I'm feeling under the weather for quite awhile, I can't resist not having to share at least one more Christmas nail art design. Since the previous one was red themed, I figured I should do something green for a traditional color match. I used a white background with 2 coats of Dazzle White Lightning. Initially, I thought of using a neutral hue as base to achieve a vintage look but backed out the last minute. The design is freehand and painted using a detail nail art brush and acrylic paints. 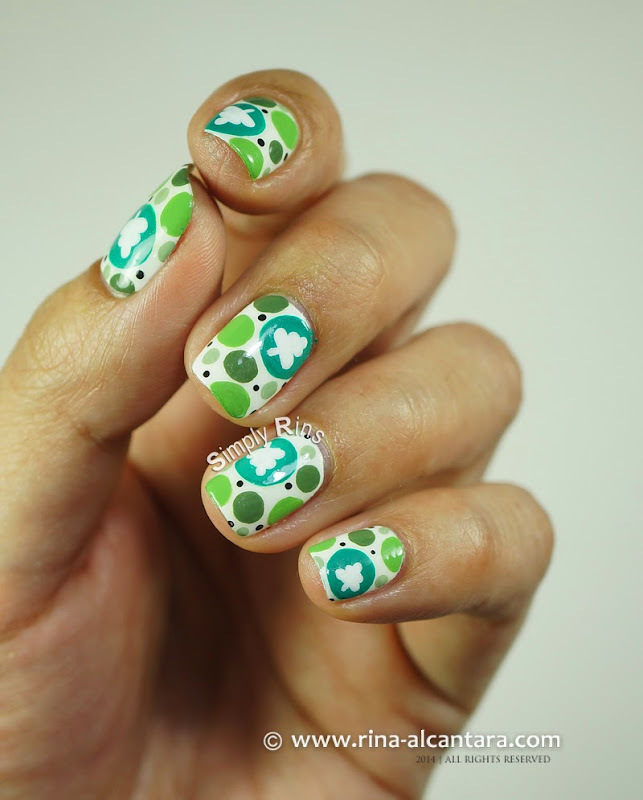 I mentioned earlier that I added a twist to this polka dots inspired Christmas nail art. I did so by painting a small Christmas Tree on the biggest circle. I really think it made this design look more interesting. It is a subtle addition, but I liked it. I also added a few tiny black dots to fill awkward spaces. I know this is not much, but I am hoping that you'll like the simplicity as much as I do. It's raining as I write this and it's very gloomy outside. I'm praying for a better weather come Christmas. On the other hand, it has been cold for a few nights and have been enjoying a cup of hot chocolate ever since. I absolutely love these, Rina. Hoping you get to feeling better soon. Being sick is not fun at all. Merry Christmas to you my friend! Hugs! This is lovely, Rins. I hope your cold is better now, and that you had a wonderful Christmas. I'm really looking forward to the designs and advice you will have for us throughout the New Year. May it be a happy and prosperous one for you and all your loved ones. I love keeping my nails clean and perfect. I always take care of things, but I think your list is going to help me keep them even better. Thanks for sharing these tips. Will definitely keep these in mind the next time I visit a Nail Salon.